We often produce custom wallpaper installations based on photographs, which can range from any myriad of subjects. We also produce a lot of custom wall murals based on artwork. 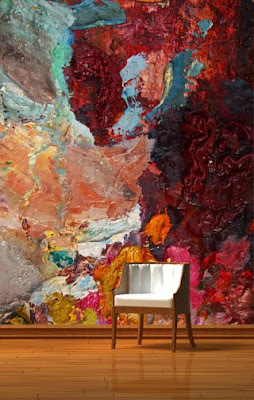 Some of the most striking wall murals that we've produced are abstract paintings. There is a lot of impasto work in the most engaging murals based on abstract artwork, a technique that often raises paint strokes on the canvas, giving a highly textured look. This texture translates well onto wallpaper, giving a trompe l'oil effect, as if the paint were jumping right off the wall. The inspiration room features a whole other breed of abstract art. The image is of an artist's palette. The paints swirl around each other, with gradients of color evidencing the mixing that the artist has done to achieve certain colors. An unexpected work of abstract art, but very interesting nonetheless, perfect for a custom wall mural.